The unincorporated community of Lake Tapps is located in Pierce County on Lake Tapps reservoir which offers about 45 miles of complex shoreline, with multiple islands, peninsulas and inlets, meaning prospective waterfront real estate buyers will find a wide range of options to choose from. As compared to many popular waterfront communities in the Puget Sound, Lake Tapps is less densely populated and less expensive too. Lake Tapps homeowners have easy access to big city amenities in Tacoma, and a wide range of outdoor activities steps from their door, including boating and fishing in the lake which is home to fish like smallmouth bass, carp, and perch. Worried the water won’t always be there? Lake Tapps and nearby cities that surround the lake worked with the Cascade Water Alliance to ensure future water needs will be met for about 50 years. At any given time, you’ll find both quick move-in Lake Tapps waterfront homes as well as new waterfront homes being built, meaning it’s practically guaranteed that you’ll find the ideal Lake Tapps waterfront real estate you’re looking for. With prices that range from under $100K to multimillion dollar beauties, and sizes ranging from about 900 to 9,000 square feet, there’s sure to be a waterfront home that fits your needs. Keep in mind that while newly built Lake Tapps homes are typically more expensive than resale offerings, the cost savings that come with buying a new home like lower energy and maintenance costs, can make help make your dream of waterfront real estate come true. While property in Lake Tapps is less expensive than big city real estate, you’ll be able to enjoy swimming, boating, and wake boarding in a wealth of inlets and coves, as well as walking or biking trails on land, meaning boredom is a word seldom heard here. Take advantage of our industry-leading tools to make your property search as easy as possible and be sure to register for a FREE account so that you can receive email alerts whenever new Lake Tapps waterfront real estate for sale hits the market. 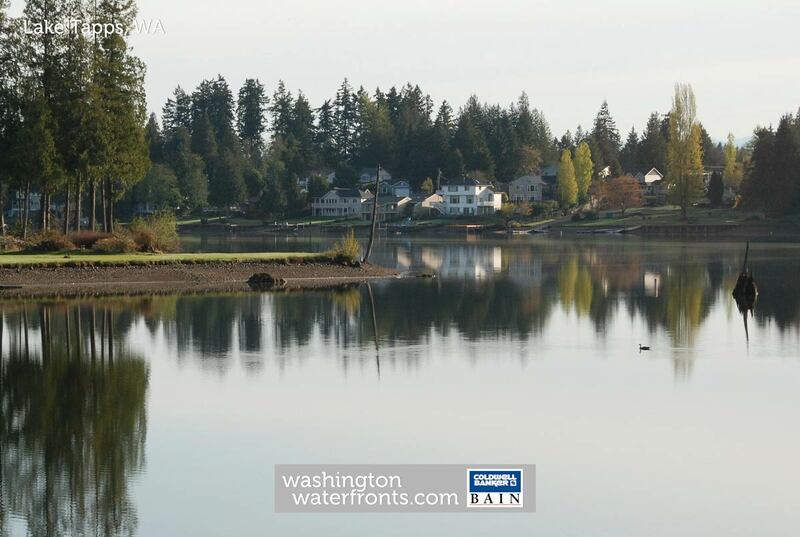 If you're seeking to sell your Lake Tapps waterfront property, contact our Waterfront Specialists directly for a comprehensive listing analysis and to learn more about the cutting-edge marketing strategies we'll use to sell your home quickly for top dollar! Lake Tapps is a nearly 2,500-acre reservoir in Pierce County about 20 miles east of Tacoma and just north of the City of Bonney Lake. While its shores can be accessed year round, the level of the lake is down throughout winter and early spring, preventing boat access although fishing is possible from its banks. Visiting one of the parks along the shores of Lake Tapps is the best way to enjoy the numerous activities available here such as swimming, boating and fishing. Lake Tapps North Park is set along the north banks of the lake at 1715 198th Avenue East in Bonney Lake while Allan Yorke Park is a popular community park and the biggest in Bonney Lake located at 7203 W Tapps Highway E.
Lake Tapps North Park offers spectacular views of Mount Rainier to the south on a clear day as well as an ideal place for kids and adults to swim. This mostly undeveloped 80-acre site has nearly 10,000 feet of waterfront access. You'll find a number of amenities here such as a boat ramp, concession stand, picnic tables, restrooms, barbecue grills and trails. The park also offers three miles of undeveloped and natural surface trails with the opportunity to hike through a mini-urban forest or along paved trails. Lake Tapps North Park is open from April through September, 7:30 a.m. until 8 p.m., but keep in mind that the lake is not filled to capacity until mid-May. Arrive early on weekends and hot days to snag a parking space. Allan Yorke Park offers a fenced-off portion of the lake for swimming with free lifejackets available for use as well as a public boat launch and fishing dock. You'll also find a large grassy area that is ideal for picnics or sunbathing. The park includes three baseball diamonds, a skate park, playground, two tennis courts, a basketball court and a concession stand. The boat launch at Allan Yorke Park requires a fee of $8.50 per launch or a boat launch pass available at the Utilities Desk at the Justice & Municipal Center located at 9002 Main Street East in Bonney Lake, currently for $30. Lake Tapps is open year-round for fishing and supports naturally reproducing populations of largemouth and smallmouth bass, yellow perch, stocked tiger muskies and black crappie - tiger muskies under 50 inches must be released. The best shore access for fishing can be found on the northeast shore at Lake Tapps North Park or the western shore at Allan Yorke Park. Golfers won't want to miss enjoying a round at Tapps Island Golf Course, rated the best 9-hole course in Washington by Inside Golf magazine. They note, "The scenery is beautiful, with the lake bordering the first few holes; on a clear day you have an unobstructed view of Mount Rainier sitting just off to your left as you tee off." The Lakeside Grill found at the course serves breakfast, lunch and dinner. Here you can sip cocktails or enjoy your meal while watching fabulous sunsets on the upper outside deck.